Happy Thanksgiving! Please Don’t Pass the Canned Cranberries. Growing up in the 1950s and 1960s, I must have been one of the few children seated at the cousins’ table who didn’t mind eating jellied cranberry sauce from the familiar white, blue and red can. I have fond memories of my mother opening it with her handheld can opener, inserting a knife around the inside to loosen the gelatinous concoction, and the whoosh with which it slid out, shimmering and ridged, onto the plate. My mother was a terrific cook, and I must have reasoned that the least I could do was permit her this one convenience, especially when she stuffed and roasted the turkey at our home in Elyria, and then struggled to secure it in a box to keep warm while my father drove us to my grandmother’s house in Lorain. Ironically, it was at my grandmother’s—one of the greatest cooks to come to America from Sicily—where I suffered through what I believe to be the most disgusting side dish known to any holiday table: ambrosia, prepared and served with great fanfare by my mother’s sister, who, it must be said, did not inherit the cooking gene. Aunt Helen’s ambrosia looked pretty enough, with its own bright red Jell-O shimmer, but its other ingredient was cottage cheese, something I’ve never liked. I could barely force the stuff down. As I think about it, the canned cranberry sauce was a winner by sheer comparison. With the passing years, my palate grew more sophisticated. And although I never learned to appreciate my aunt’s culinary effort (the only recipe, actually, that she ever mastered), my disdain for canned cranberry sauce, with its heavy-handed tartness and slightly tinny flavor, finally blossomed into something like hatred. Give me a dish with layered flavors! Give me subtlety and nuance! 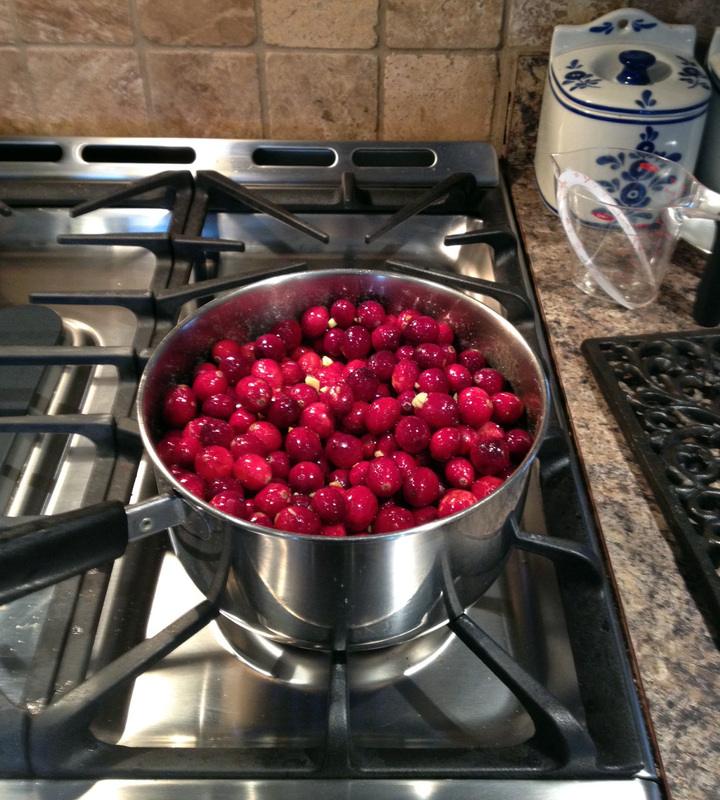 Give me, if you will, Ginger Cranberry Sauce. I clipped the recipe from an old Parade magazine article back when the late Sheila Lukins of Silver Palate fame was the food editor. I don’t remember how long ago the recipe was published; but I can no longer remember a Thanksgiving when I didn’t make it. In a line-up of labor-intensive holiday recipes, this is the easiest thing in the world to put together, and it can be made weeks ahead of time. I hope you enjoy it, and I wish you and yours a very Happy Thanksgiving! 2. Skim any foam from the surface with a metal spoon. Let cool. Refrigerate, covered, for up to 2 months. Freezes well.